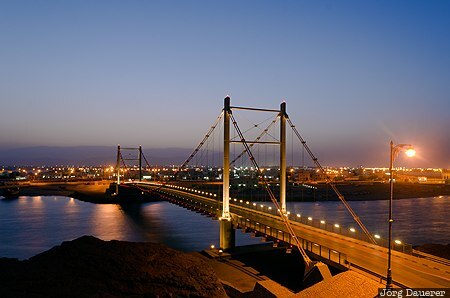 The illuminated suspension bridge Khor Al Batah in Sur at the blue hour after sunset. Sur is in Ash Sharqiyah in the east of the Sultanate of Oman. This photo was taken in the evening of a sunny day in March of 2012. This photo was taken with a digital camera.